Located in the Maksimir Park, this is one of the Zagreb hotels that offers guests a quiet location but easy access to the city center. The hotel is located in the city's center, though it is in the green belt of the city, and it offers guests access to the city's many historical and cultural attractions, including the zoo in the park, which is the second largest in all of Croatia. The Hotel Vila Tina Zagreb is also surrounded by lakes, which offer guests relaxation while on their leisure or business trip. The Hotel Vila Tina Zagreb is easily accessible by car, or guests can get around town on foot or by using the city's public transportation system. The rooms of the Hotel Vila Tina Zagreb are large and are decorated in a Croatian style so that guests can relax in an interesting atmosphere. 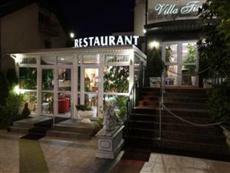 The Hotel Vila Tina Zagreb is decorated in a classic Croatian style, but it offers plenty of modern amenities. The hotel offers guests a buffet breakfast each morning, and guests can also enjoy the hotel's on-site restaurant, which serves an a la carte menu featuring local cuisine and international favorites as well as a large selection of wines.